Charles McPherson (alt); Keith Oxman (ten); Chip Stephens (pno); Ken Walker (bs); Todd Reid (dms). 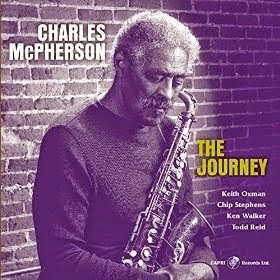 Is Charles McPherson the greatest living jazz master/saxophone player? On the strength of this disc I'm inclined to concur. I had similar thoughts back in the 1980's/early '90s, when I heard him at Newcastle's Corner House - and there were still a lot of grandmasters doing the rounds in those halcyon days! His playing here is little short of perfection - the bebop, thankfully, is still there but so are the influences he picked up along the way by association with Mingus, Barry Harris and, naturally, Parker [McPherson provided the live alto solos in Eastwood's biopic Bird.] this may be the best alto playing you will hear all year and it's only February 3! Having said that, this is no one man show. Keith Oxman blows enough tenor to suggest that, in years to come, he too will have reached legendary status! He's pretty damn close here! The two saxes blend well and shine individually. Behind them is a rhythm section that the early bop pioneers would have died for. My choice for January's CD of the Month was Capri's release - Jeff Hamilton Trio; Great American Songs. Although it's early days, I'm not betting against this being two in a row for Capri!